Whether your anxiety occurs because of personal problems, or because of work, experiencing it while you’re on the job makes everything much more challenging. Anxiety makes it difficult to focus on a specific task. This can make getting to your work assignments almost impossible, and take you forever to get things done. If left untreated, your anxiety has the ability to make your job impossible. Which can result in issues, like getting fired or your boss not knowing if you’re capable enough to do your job. But, anxiety is a very real thing. And if you don’t have the right resources to work through it yourself, that doesn’t mean all hope is lost. Having anxiety doesn’t mean you’ve stopped caring about your job. It just means there are other factors that are making it that much harder to think work is important right now. Waking up, chugging coffee and heading straight into work is a great recipe for anxiety. Without giving yourself time to slowly wake up and get ready for the day, you’ll feel on edge the whole day. Some people thrive by getting up and going, and not thinking about anything. But, anxiety can easily creep in if you don’t practice being more in-tune with yourself and the world around you. I get that it’s helpful to stay up-to-date on what’s going on in the world. I used to watch the news every morning before I went to work. But, I started to realize that it made me a lot more fearful of my surroundings. The bad news I kept seeing just started to make me think there wasn’t much good in the world. If you have high anxiety, try to stop watching the news or reading it on your phone. It doesn’t mean you’re avoiding what’s happening out in the real world, it just means you need to stop triggering anxiety by bringing in more worries to your life. If you think about it, the news stations are trying to find the most crazy stories out there. That’s how they get your attention and keep you watching. And that’s why usually what’s shown on the news is bad stuff. Chances are, you’ll hear about the important stuff from co-workers or friends. You don’t need to know about everything else. Commuting in traffic can contribute to your anxiety. A great way to stay calm is by listening to a mindfulness app on your phone while you’re driving in the car. This helps you focus on your breathing and stay in the present moment. That way once you get to work, you won’t already feel so tense and possibly irritated. Another helpful tip is to always leave a little extra early heading into work, so you can stay in the slow lane. Driving in the fast lane can make you feel like you have to just get to the destination. When instead, you can take your time and not feel so rushed. Once you get into work and figure out what has to get done that day, start by planning it out. Part of what causes a lot of work anxiety is feeling like you’re constantly behind. And you have to hustle to get as much done as you can. 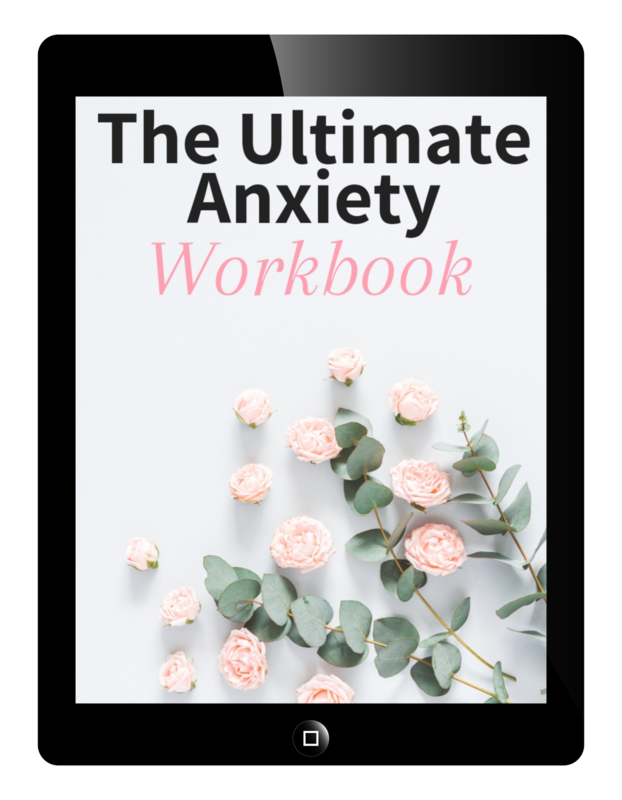 But, that’s how anxiety can form and it’s how it can prevent you from getting anything done. Feeling overwhelmed can make it difficult to know where to start. Instead, look at your to-do list and focus on getting 3 or 4 things done that day. Set mini goals, so that once you accomplish one thing you actually feel like you’re being productive and achieving success. Sometimes, you’ll have days where no matter what you do you’re anxiety will take over anyways. On those days, you have to take it easy on yourself. When anxiety comes in, it’s similar to getting a cold. It physically and mentally won’t allow you to be 100% there. And if think about having a cold, you would most likely do the best you can but then rest often and take it easy. Don’t expect to get much done on high-anxiety days. Where we often go wrong when we’re feeling anxious is when we feel like we have to keep working harder. But, listen to your body and just take a break. Work on grounding techniques and pay attention to what’s going on in the moment. Our anxious thoughts can make it feel like everything is wrong. But, when you practice being mindful you can reduce the negative thoughts. And you can work on dissolving your anxious thoughts, when you take a few minutes to think them through and challenge them. Eating a healthy lunch is always good idea, even on the days when you’re anxiety is low. If you work in a busy office, it’s probably pretty normal to just order some fast food and go back and sit at your desk. But, taking control of your anxiety requires taking care of yourself. That means actually taking a lunch break, and packing your lunch from home. With a filling salad or a healthy sandwich. Eating healthy will keep your anxiety levels even, and won’t make you crash a few hours later. Practice making it a point to take some time for yourself throughout the day, so that you can stay in tune with your body. When you struggle with anxiety, it’s just not possible to keep trying to hurdle passed it. If you try to fight it or ignore that you have it, it will eventually build and build. Until you aren’t sure how to manage any of it. Most jobs think it’s more acceptable to just work, work, work until it’s time to eventually go home. The norm is 50 hour work weeks, when working 40 hours is way more than plenty. We think we have to be tied to our jobs to feel any sort of value or success in our own lives. That’s why taking breaks during work feels weird. Especially when everyone around you never takes any. But, go against what everyone else is doing and make it a point to start taking care of your mental health. That means taking the designated 15 minute breaks you’re allowed for every 8 hours. Also, taking your lunch break. These can be times where you can practice being mindful and reducing your anxiety. It is so easy to leave work, then go home and either still think about work or continue to do work. This is where it will feel like you can never escape it. But, there are ways to actually enjoy your life outside of work and to separate yourself from it. It starts by leaving all of the work at work. Don’t respond to emails after you have left the office. And avoid going on your computer once you get home. If you struggle with toxic co-workers or a difficult work environment, it’s very easy to allow that to bleed into other parts of your life. But, imagine that once you open the door to leave your office, all of the issues you have at your job cannot leave that door. And then once you get home, work on focusing on other things that bring you joy. Try to avoid getting wrapped up in your thoughts about your job. Practice being in the present moment and focus on the now. That way you can actually enjoy the time off that you do have. And just tell yourself that you will deal with work tomorrow, when the time comes. Working 8+ hours a day and then driving in traffic is exhausting. That’s a long time to give your energy to another place. And once you get home, you might feel too tired to do anything but make up some dinner and watch TV. But, this is how it can be easy to think that your job takes over your whole life. It’s important to create things on your schedule that you look forward to after work, that can take you away from work for a while. Try to set up 2 or 3 nights a week that you have something exciting to look forward to. This can make going to work more tolerable, because you will be doing something you enjoy afterwards. It will also break up the cycle of getting up, going to work, coming home to eat dinner, sleep, repeat. On the days that you don’t schedule trying something new, work on practicing self-care. Do what you want to do. If that means enjoying a Netflix marathon, do it! Throughout the day, your cup is being drained from all of the work crap you have to put up with. Find the things that fill up your cup, and make sure to do these thing frequently. And if you aren’t sure what fills up your cup, think about the things you enjoyed as a kid. During the times when you didn’t have to be a responsible adult. Maybe you could even try going to the same park you used to play at as a kid, and mess around on the playground. These things will help reduce your anxiety, because they allow you to connect with yourself. Talking to other people who understand what you’re going through helps in so many ways. And if you know people who experience anxiety as well, make sure to reach out to them during the days when you’re anxiety is high. It helps to talk to someone who understands, and who doesn’t judge. Sometimes when you’re around people at work who don’t get it, it can feel like there’s just something wrong with you. In reality, everyone experiences stress and anxiety to some extent. Most people don’t know how to deal with it (that’s why they bury themselves in their jobs). When you are experiencing anxiety, talk to someone about it. That way you can get your anxious thoughts out and hear what other people have to say about it. Having an evening routine before bed will help calm you down after a long day. It can also help improve your sleep. And when you struggle with anxiety, these morning and evening routines are essential to keeping your anxiety in check. If there is someone at work who you trust, don’t be afraid to talk to them. Anxiety is a serious thing if you aren’t sure how to handle it. It can ruin your productivity, and if your anxiety is caused by work, it will have an effect on your overall wellbeing. That is something that your boss or HR would want to know about. A lot of companies are expanding their resources when it comes to mental health. If you can talk to someone your trust about what you’re experiencing, they might be able to help you. If there isn’t anyone at work you feel like you can trust to talk about these things, it might be time to reevaluate where you’re working. Your job might what is causing your anxiety to shoot through the roof. Anxiety occurs for a number of reasons, but sometimes it’s the environment that we’re in that can set it off. Think about how your job makes you feel when you’re there, and if there is anything that causes you stress there. Also, think about your co-workers and who you would feel comfortable talking to about your anxiety. If you come to the conclusion that your job is what is causing anxiety, and there are a lot of things wrong with it, you should consider trying to find another place to work. I understand that sounds way easier than it is. I’m not saying that you should just go in and quit your job tomorrow. We all have bills to pay and responsibilities. But, if you know your job is causing you anxiety, I am here to tell you there are other options. You should never feel stuck where you’re at. Start by writing down a pros and cons list of your job, then think about the type of job you would really enjoy. You can slowly work on trying to find a new one, while practicing the things above. Anxiety is not the easiest thing to handle on your own. Especially if it has grown over time. Sometimes, talking to a professional is one of the best ways to sort through your thoughts. A therapist can work with you to give you the right tools you need to work with your anxiety. That’s why I always recommend using BetterHelp. BetterHelp matches you with a licensed therapist who has professional experience in teaching you how to get through social anxiety. The cool part is you can connect with your therapist any time you need to. If you have any questions throughout the week, you can just shoot them an email or a message, and they usually get back to you within a day or two. When I used to go to in-person therapy, it was only once a week, which sucked when I really needed to talk to someone. I would also sometimes forget what I needed to talk about, and end up remembering later and would have to wait another week to talk about it again. BetterHelp is there for you when you really need it. If you’re interested in learning more about BetterHelp, you can click here. Do you have more questions about overcoming social anxiety? Leave them in the comments below!